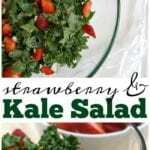 Kale strawberry salad that’s a perfect barbeque side dish or served with dinner! Just a few ingredients for a healthy salad with a dash of fruit. Ok so we have a love for kale…yes, even my kids. We visited a local farm recently, picked our own kale and strawberries, and had an amazing kale strawberry salad that we just had to try and duplicate when we got home. 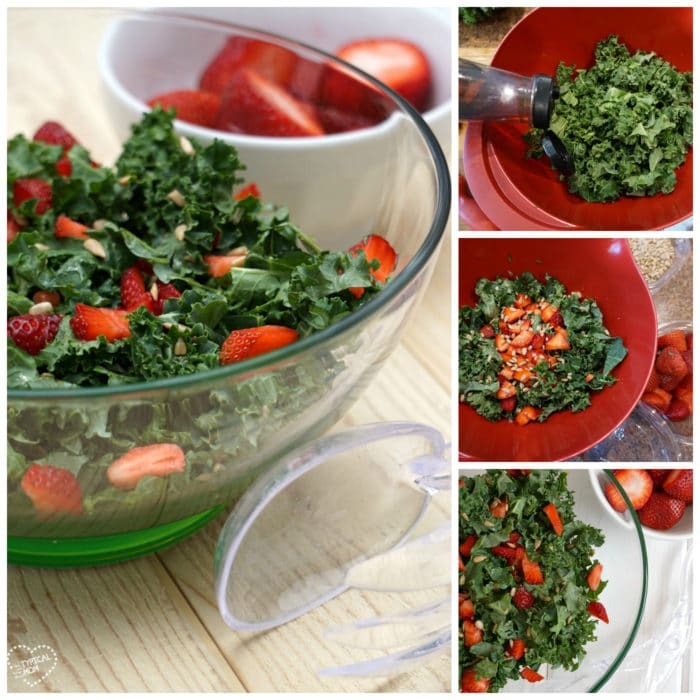 Let us share this easy kale salad recipe with you! Doesn’t this look ahhhhhhmazing??!!! So like I said, we went strawberry picking and you can even pick veggies at a local Southern California farm called Tanaka Farms and just had to recreate the salad they served us. Kale is so good for you but it does have a distinct and somewhat strong flavor so sweetening it up a bit with agave nectar is a great way to counteract that. If you’ve never had agave nectar you can use it in so many ways. You can use it instead of syrup on pancakes, mix it up as a vinaigrette for salads or use it as is like in this salad recipe or in a fruit salad! Add diced fresh strawberries and sunflower seeds…and BAM……you’ve got yourself a tasty, healthy, pretty, and inexpensive side dish! 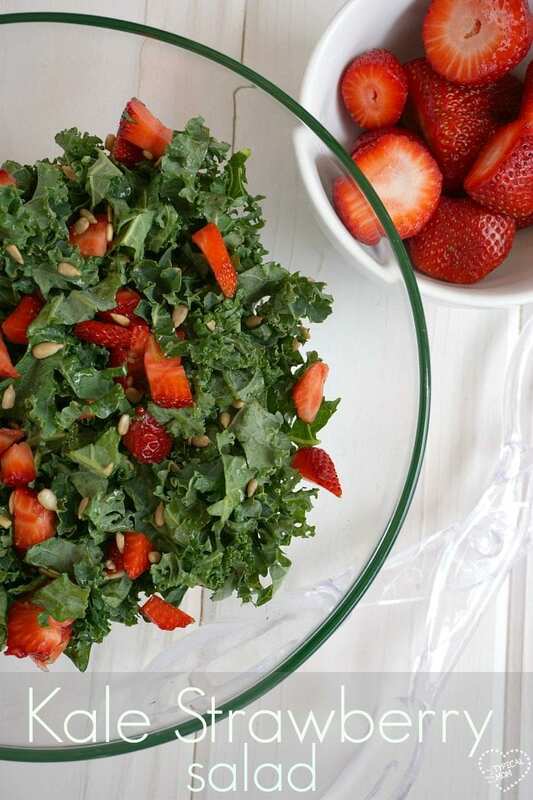 Kale strawberry salad that's a perfect barbeque side dish or served with dinner! Just a few ingredients for a healthy salad with a dash of fruit. Wash kale and cut middle stem off. Dice into small pieces (almost like cole slaw size) and toss with dressing mixture. Use as little or as much as your taste buds prefer, massage into kale. Dice strawberries and add those as well as sunflower seeds into your bowl. Toss gently and serve. It is always nice to have a tasty side dish you can just throw together with a few ingredients when you’re going to a barbeque or over to someone’s house. 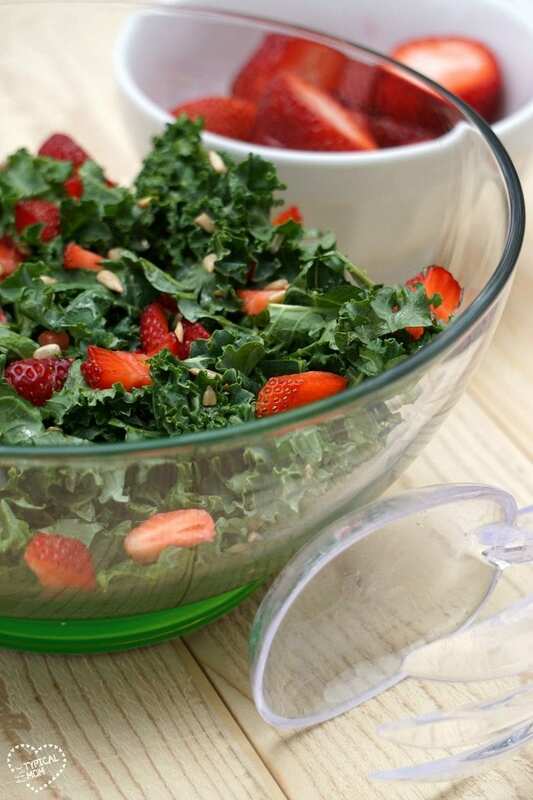 This kale strawberry salad recipe is a great one to keep on hand! If you love kale too try our easy kale chip recipe here….my kids snack on these like chips!